Shut off trailer air supply to lock trailer brakes. If trailer is empty, lower the landing gear until it makes firm contact with the ground. 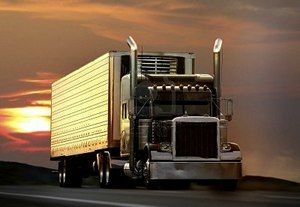 If trailer is loaded, after the landing gear makes firm contact with the ground, turn crank in low gear a few extra turns. This will lift some weight off the tractor. (Do not lift trailer off the fifth wheel.) This will make it easier to unlatch the fifth wheel and easier to couple next time. Disconnect air lines from trailer. Connect air line glad hands to dummy couplers at back of cab or couple them together. Hang electrical cable with plug down to prevent moisture from entering it. Make sure lines are supported so they will not be damaged while driving the tractor. Pull tractor forward until fifth wheel comes out from under the trailer. Stop with tractor frame under trailer (prevents trailer from falling to ground if landing gear should collapse or sink). Pull the release handle to �open� position. Keep legs and feet clear of the rear tractor wheels to avoid serious injury in case the vehicle moves. Use the tractor parking brake and/or chock the wheels to hold the vehicle. Wait for air pressure to reach normal, then push in the red �trailer air supply� knob. This will supply air to the emergency (supply) lines. Use the trailer hand brake to provide air to the service line. Go to the rear of the rig. Open the emergency line shut-off valve at the rear of the last trailer. You should hear air escaping, showing the entire system is charged. Close the emergency line valve. Open the service line valve to check that service pressure goes through all the trailers (this test assumes that the trailer hand brake or the service brake pedal is on), then close the valve. If you do NOT hear air escaping from both lines, check that the shut-off valves on the other trailer(s) and dolly(s) are in the OPEN position. You MUST have air all the way to the back for all the brakes to work. Charge the trailer air brake system. (i.e., build up normal air pressure and push the �air supply� knob in.) Shut off the engine. Step on and off the brake pedal several times to reduce the air pressure in the tanks. The trailer air supply control (also called the tractor protection valve control) should pop out or go from �normal� to �emergency� position) when the air pressure falls into the pressure range specified by the manufacturer (usually within the range of 20 to 45 psi). Trailers will have yellow ABS malfunction lamps on the left side, either on the front or rear corner. (See Figure 6.7.) Dollies manufactured on or after March 1, 1998, are required to have a lamp on the left side.